Cast iron cookware has been used for thousands of years and still remains an elite cookware. It is inexpensive, especially when compared to most stainless steel. Also, it is sturdy and will last and wear well over the years making any investment in a cast iron set a financially wise one. Cast iron cookware can be used over any heat source. Use it on the stove-top, in the oven, or over an open fire. Cast iron is perfect for everyday cooking and is the survival cookware of choice during emergencies. There are health benefits of using cast iron cookware. You can boost your iron intake from eating food cooked in cast iron cookware. And the body needs iron because it’s an essential mineral for boosting energy levels and the immune system. Last, but certainly not least, food cooks beautifully in cast iron. Any kitchen chef will appreciate it’s non-stick surface and how easy it is to clean. 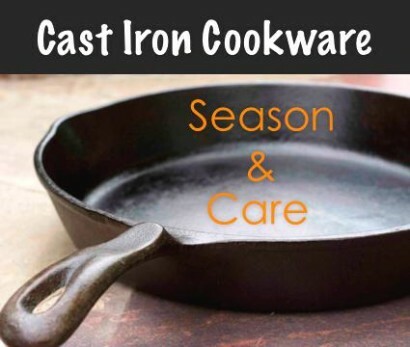 Here’s the important part that many don’t know: Part of the success of cooking with cast iron cookware is that you must properly season and care for it. The link below will take you through all the steps you need to know to do this.